The Total Immersion developers released a free iPhone app in the App Store a few days ago that uses augmented reality face-tracking technologies to let you try virtual glasses and see how they fit. 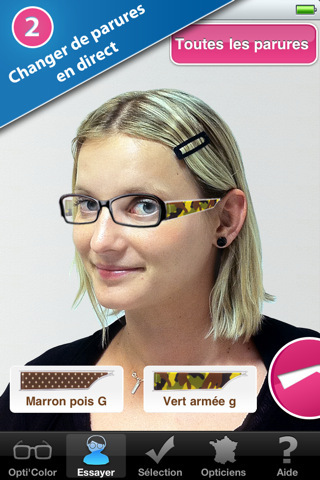 The app -- Atol les opticiens -- was commissioned by French optician and eyeglasses retailer Atol and, apparently, it's the first of its kind to land in the App Store that relies on this kind of face recognition to allow you to try various models of glasses. Unfortunately, the app is in French so if you want to try it prepare to see a lot of "telecharger" and "Oui". This is the most fully realized mobile commerce application ever to use augmented reality, and the first AR app in the m-commerce space featuring face- tracking technology, newly available on mobile,” said Bruno Uzzan, co-founder and CEO, Total Immersion. “Face tracking is ideally suited to purchases like eyeglass frames, where it’s essential to try before you buy. In this environment, the m-commerce experience is both more convenient and more satisfying for consumers and merchants alike. Product selection is virtually unlimited – and those with corrective lenses can keep them on through the AR fitting. I tried the app and, after a few calibrations, it works pretty well. Check out the video below, and go download here.